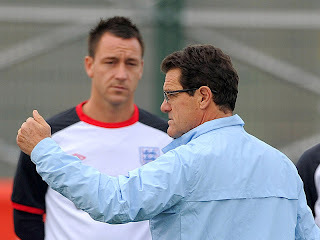 In the week which saw England manager Fabio Capello defy his employers at the Football Association by criticising their decision to strip John Terry of the captaincy, democracy and forward-thinking have prevailed on the same issue in Australian rules football. With Terry heading to court on racism charges just days after the end of the European Championships, the FA took what many believed to be the smartest option, taking the armband away from the Chelsea defender. If Capello was within his rights to disagree privately, his appearance on Italian TV to rail against the decision, telling the world "John Terry is still my captain" has only weakened his own position as well as widening rifts within the England squad. Managers and coaches live and die by making the big decisions which invariably upset some of the players under their leadership. But it doesn't have to be that way. St Kilda Football Club, one of 10 Melbourne-based teams in the Australian Football League, have announced Nick Riewoldt as their captain for the 2012 season, continuing in a post he has held for the past five years. Scott Watters is gearing up for his first campaign in charge of the Saints, although it wasn't the rookie coach who re-instated Riewoldt. At the end of a three-day pre-season camp, the St Kilda players were asked to vote for their choice as captain, with Riewoldt almost unanimously elected. "Everyone at this club is 100 per cent behind him and that's why I wanted this process to occur," Watters explained to his squad. Riewoldt added: "It's an honour to lead this footy club. It's a position I've held for a while now, it's one I truly value but I've never really been as excited before as I am about this year and what it holds. Thanks for your vote of confidence, with the voting." What a different atmopshere would pervade England's Euro 2012 training base in Poland if their on-field leader was democratically elected from within the changing-room. Instead, the new captain will know he was Capello's second-choice behind the devisive Terry, who denies the charge of racially abusing QPR defender Anton Ferdinand. Winners of the PFA Players' Player of the Year award place such high value on the trophy because they've been honoured by their peers. Similarly, a captain chosen by his team-mates could lead with absolute confidence in their backing and they, in turn, could not question his position. Off-field distractions and scandal have plagued England for years. The same has been true at St Kilda in recent times, though, with Riewoldt questioning his own leadership qualities last summer after young Saints players broke a drinking ban and curfew. Capello has thrown himself into a tug-of-war with the FA over his choice of captain. Watters clearly prefers a more open, transparent approach. 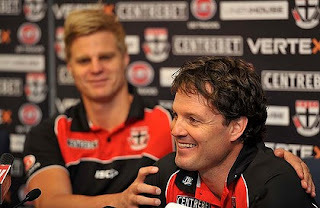 Before the recent St Kilda camp, he told The Age newspaper: ''I want the whole leadership model to be reassessed, and that includes who our captain is and what our leadership is. "The byproduct is to send a clear message to the group that everyone's accountable and the slate is clean. Australian rules football leads the popularity contest on this vast island. On the issue of captaincy, perhaps English football and the rest of the sporting world should take its lead. Long live democracy. *Fabio Capello resigned as England manager hours after this blog was published.